Now that you re a mature woman, you re smart enough to know that . . .a tight ponytail can take five years off your face. More bright, brassy opinions from the fountain of truth! From the author of Not Guilty by Reason of Menopause comes another unapologetically feisty manifesto. 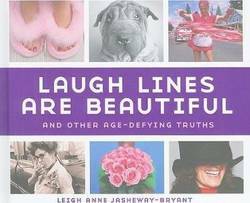 Laugh Lines Are Beautiful celebrates everything from the dubious benefits of maturity, moderation, and perky mammaries to the singular pleasures of mood swings, mammograms, and myopia. In comedienne Leigh Anne Jasheway-Bryant s pasture, there are no sacred cows. Growing older (and hopefully, wiser) with style and sass and a slightly sagging posterior trumps investing in anti-aging goo, inflatable face and body parts, and ill-fitting foundation garments any day. So why age gracefully when having a midlife crisis feels so good?"